Here’s what roller derby is and what it isn’t. Don’t be fooled by the movies; derby is a real sport with rules and referees. You can’t punch each other in the face. Some of the most incredible shows of athleticism and grace are out there on the track. It’s speed skating, stamina, and blunt force trauma—plain and simple. Still here? So you’re not a sissy. You can play with the big girls. But can your friends and family live without you for a minimum of 3-5 nights per week? Derby leagues are run by the skaters for the skaters. (Actually, it’s more like by the skaters, coaches, officials, medics, announcers, photographers, sponsors, and other generous volunteers.) D.I.Y. means not only a time commitment for practice but also bouts, committee meetings, fundraisers, community service, and more. My husband calls himself a derby widow, but he knew what it meant when I laced up my skates for bootcamp. 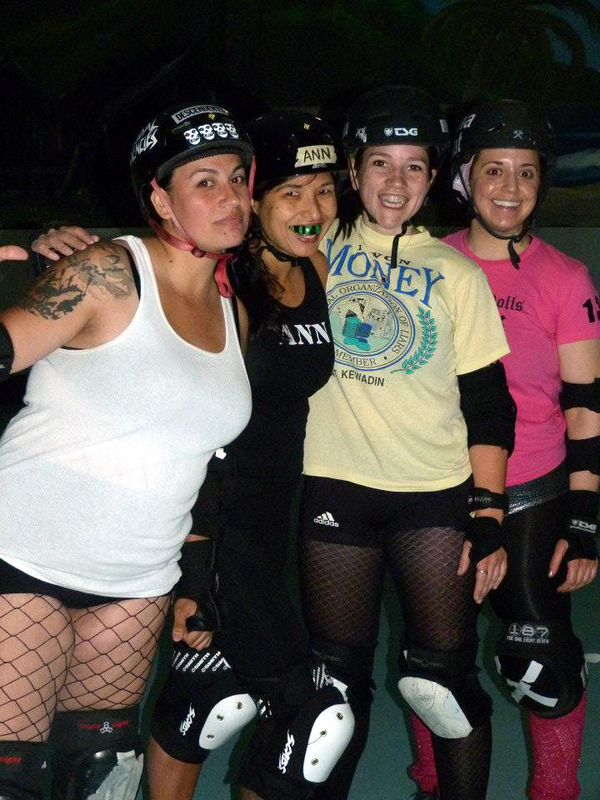 Fall 2011 Bootcampers: Patty Hearse, Ann, Corey and MonaStat. Photo by Julie D.
Be prepared to fall...not just on your tailbone, hips, and knees...but madly in love with this sport. I warn you, it can consume the best of us. You’ll be trying to “find the hole” as you dodge traffic on the freeway. You’ll be doing squats as you brush your teeth to achieve the lowest derby stance. And you’ll be having sweet dreams of grand slams and unicorns (25-point jams). If you think you’ve got what it takes, shoot us a message at recruitment@svrollergirls.com to get invited to our next bootcamp, which starts April 18th and come check out one of our bouts. The glossary is awesome! Thanks. I'm doing a blog piece on the new Roll Shop up the street and needed to get a bit with it. But why do we fall so hard for derby? Do netballers or softballers experience the same infactuation?